Hello and happy Monday! 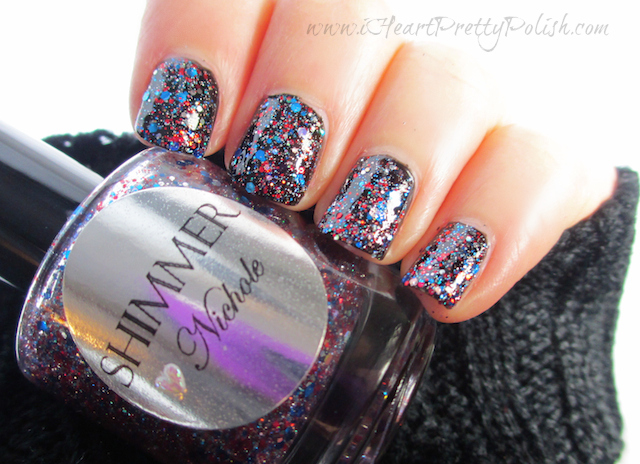 I have another Shimmer Polish to show you today. This is Nichole. Talk about hard to photograph - good grief. I just couldn't get a shot without the glitter looking blurry:( I must have been shaking or something. As with all of the Shimmer Polishes, the glitter is sooo sparkly. This one has so much going on with the different sizes of red, blue, and silver glitter. I layered Nichole over Orly Liquid Vinyl. I have been enjoying using black under some of these glitters lately. It just shows off the glitter so beautifully! I also tried this one over Zoya Trixie and it looked really neat. I have been impressed with the Shimmer Polishes I have tried and am excited to try the rest! 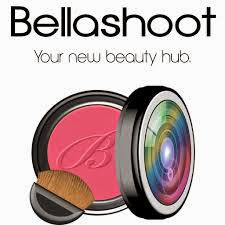 If you didn't see Julia, check it out here. In that post, I also explained how the creator names her polishes. 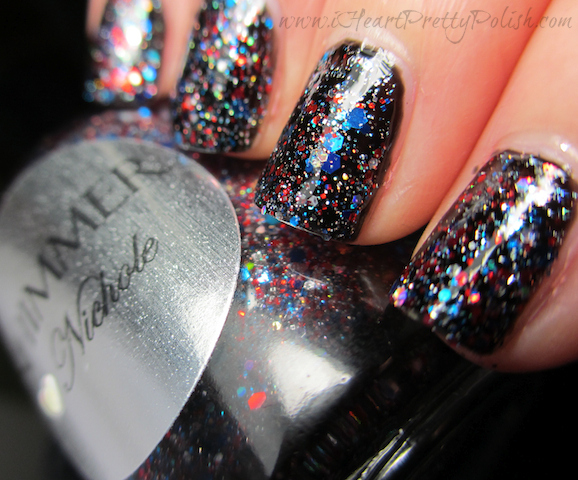 Note: Shimmer Nichole was provided to me for review. See my Disclosure Policy for more information. Thanks. I know, it's so frustrating. I probably took like 200 shots of this! 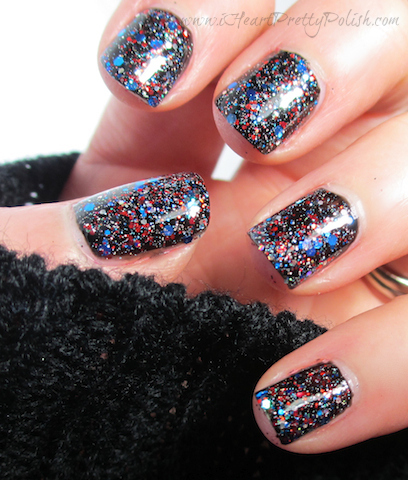 Another really cool glitter! Someone on fb said this would look awesome mattified, I think? Anyhoo, I totally agree. What a fun collection. I saw that. I am thinking it would be easier to photograph if it were matte too! Thank you. Happy Monday to you too. I'll have to look up your Picture Polish. Oh, I bet it does. You should wear sunglasses!